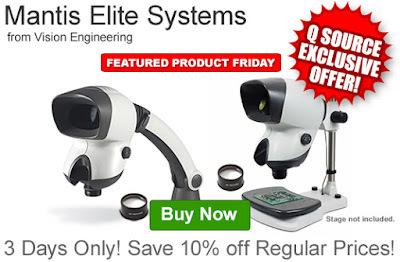 Get an extra 10% off the regular price of select Vision Engineering Mantis Elite Systems. Our FPF093016 Coupon Code is auto applied when you add an eligible Mantis Elite system to your shopping cart. This Featured Product Friday (FPF) promo is valid from today, September 30, 2016 through Sunday, October 2, 2016 and the code is unlimited use. Vision Engineering’s Mantis Elite Systems incorporate the most modern advances in optical design with LED illumination and a small footprint, giving a superb price/performance ratio. Vision Engineering’s patented, high-performance “eyepieceless” stereo microscopes offer true 3-D imaging and superb operator comfort levels. Click here to shop or, for further questions about Featured Product Friday, please read our informational blog post, call us (800-966-6020), or send us an email. Please note: This promo is valid only at QSource.com and expires on October 2, 2016. Leading off this week’s column: Workrite Ergonomics’ post looks at an interesting study that shows what happens to our brains when we don’t get enough sleep. When we hear the term leprosy, we think of an ancient disease. But this post from Agilent Technologies reveals that leprosy (Hansen’s Disease) still impacts millions of people around the world. Read on to learn about how modern technology is used to make this a more treatable disease. Do you have Gen Z and Millennials in your workplace. Check out this BioFit post that looks at how some businesses are changing their habits to meet their young workers’ preferences. Think you know how crime scene DNA works from watching TV shows? Puritan’s post shows how wrong those portrayals are. EE Times’ post presents an almost sci-fi story about how QTC (quantum tunneling composites) made of nano-particles are being used to create printable, reconfigurable touch buttons that stick on any surface. 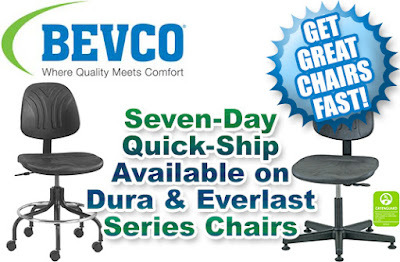 And we close out this week’s column with our new blog: Fast, 7-Day Shipping Available on Select Bevco Dura & Everlast Series Chairs. 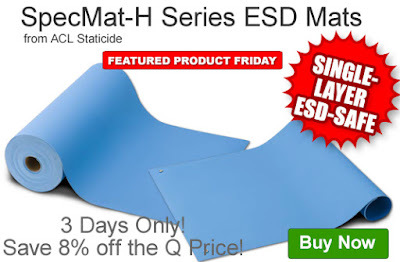 Get an extra 8% off the Q Source price of ACL Staticide’s SpecMat-H Series ESD Mats. Our FPF092316 Coupon Code is auto applied when you add an eligible SpecMat-H ESD Mat to your shopping cart. This Featured Product Friday (FPF) promo is valid from today, September 23, 2016 through Sunday, September 25, 2016 and the code is unlimited use. The SpecMat-H Series ESD-safe benchtop mat is made of a single-layer thermoplastic vinyl material. The mat delivers a typical resistance-to-ground measurement of 108-109 ohms per ANSI/ESD S4.1 and is available in .060" or .100" thicknesses. For further questions about Featured Product Friday, please read our informational blog post, call us (800-966-6020), or send us an email. Please note: This promo is valid only at QSource.com and expires on September 25, 2016. When ordering new ergonomic seating for your office, cleanroom, or laboratory environment, you want quality chairs at reasonable prices and you want them fast. 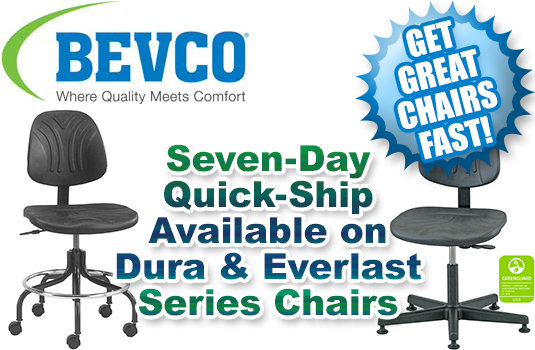 We recommend checking out our 7-Day Quick-Ship Program on Select Bevco Dura and Everlast Series Chairs, which runs through October 31, 2016. Stop standing around waiting forever for your chairs to be delivered. Don’t miss this chance to get top-quality, ergonomic chairs in just seven days. Visit our Bevco Dura/Everlast Quick-Ship Promo page today to place your order. This program expires October 31st, 2016. You may also contact us via our Web site, phone (800-966-6020), or by email. Leading off this week’s column: We hear a lot about STEM lately, read 3M’s post to find out what it is, why it matters, and how we can help students apply this type of education for their and our future. Are you an engineer? Do you like beer? Weller’s post posits that a Beer Engineer may be your dream career. Check out this post from the experts at JBC Soldering Tools to learn how to choose the best tip for your soldering application. R&R Lotion’s interesting post reveals how scientific researchers have discovered the way Lyme disease moves through the human body. In a handy, informative post from Instructables, learn all about LEDs and what you should look for when choosing the correct type for your project. And we close out this week’s column with our blog about the easy, cost-effective way that TerraCycle’s Zero Waste Boxes help you recycle waste. 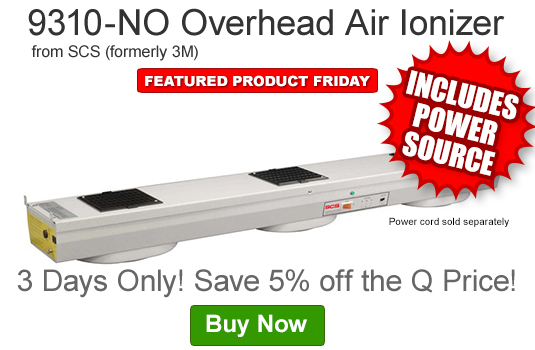 Get an extra 5% off the Q Source price of the SCS (formerly 3M) 9310-NO 100-240 VAC Overhead Air Ionizer w/Power Source. Our FPF091616 Coupon Code is auto applied when you add an eligible 9310-NO ionizer to your shopping cart. This Featured Product Friday (FPF) promo is valid from today, September 16, 2016 through Sunday, September 18, 2016 and the code is unlimited use. The 9310-NO Overhead Air Ionizer eliminates the build-up of static charges on insulative materials in a work area. Please Note: Power cord sold separately. For further questions about Featured Product Friday, please read our informational blog post, call us (800-966-6020), or send us an email. Please note: This promo is valid only at QSource.com and expires on September 18, 2016. Our SCS Complete 724 ESD Monitoring Kit Sale Ends 9/21/16! Shop Now! 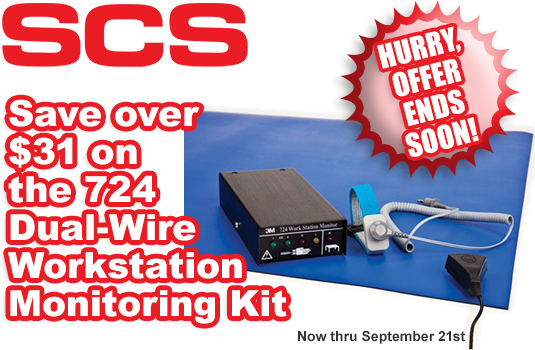 Our limited-time, special savings on the SCS 724K-WM11 Dual-Wire Workstation Monitoring Kit ends in just a few days. Shop by 9/21/16 for extra savings of more than $31. Don’t miss this chance for extra savings! Get your 724K-WM11 Dual-Wire Workstation Monitor Kit for just $236.84 today. This offer expires September 21st, 2016. You may also contact us via our Web site, phone (800-966-6020), or by email. Creating a recycling program for your company can sometimes seem challenging and expensive. TerraCycle’s Zero Waste Boxes are a simple and cost-effective way to start recycling, upcycling, and reusing waste materials. Used by manufacturers and municipalities around the world, Zero Waste Boxes provide a solution for difficult-to-recycle materials. 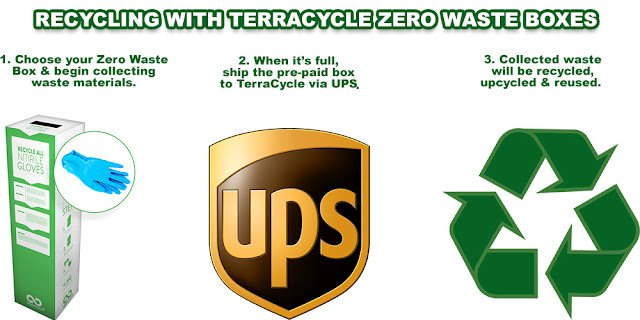 Simply select the proper box for your waste material type, promote usage of the box, and bring the full box to a local UPS location for pre-paid shipping back to TerraCycle. TerraCycle takes over from there and the waste material is processed and re-introduced into the economy. Visit our TerraCycle Department today to purchase your Zero Waste Box(es). You may also contact us via our Web site, phone (800-966-6020), or by email. Leading off this week’s column: Blood lasers. Yes, blood lasers. Workrite Ergonomics’ post looks at the use of lasers, made of human blood, to combat tumors. This post, from Agilent Technologies, says listening to music does, indeed, make you feel better. Will 3D-printed figurines soon become collectibles? 3D Printing Industry’s post examines a new trend in 3D printing: uniquely made figurines. Dave, from EEVblog, takes a look at the beautifully designed Bulova Accutron Spaceview, the world’s first transistor watch and the most accurate timepiece available when it came out more than fifty years ago. And we close out this week’s column with our email post about a great, limited-time promotion on ACL Staticide Flux Removers. 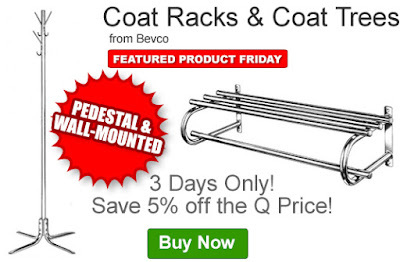 Get 5% off the Q Source price of Bevco Coat Racks & Coat Trees. Our FPF090916 Coupon Code is auto applied when you add an eligible coat rack or coat tree to your shopping cart. This Featured Product Friday (FPF) promo is valid from today, September 9, 2016 through Sunday, September 11, 2016 and the code is unlimited use. Whether wall-mounted or pedestal, these Bevco Coat Racks & Coat Trees are perfect for the office or reception area. For further questions about Featured Product Friday, please read our informational blog post, call us (800-966-6020), or send us an email. Please note: This promo is valid only at QSource.com and expires on September 11, 2016. Leading off this week’s column: You haven’t heard quiet until you’ve been in 3M’s quietest room on Earth. 3M’s post offers some awesome pics and a video tour. Tektronix’ post looks at a huge step researchers have taken in developing stretchy micro-supercapacitor graphene ribbons for use in wearable electronics. We wonder what happens to the data when the ball gets spiked. Zebra Technologies’ timely post discusses the NFL’s plan to put tracking sensors inside footballs for the first time. JBC Soldering Tools’ post presents six things you should know about Industry 4.0, the combination of manufacturing and connectivity. Cheese balls, PVC pipe, and a leaf blower. This Instructables post says that sounds like the makings of a cheese ball machine gun. And we close out this week’s column with our blog post about the new Buy 5 ACL Products, Get 1 FREE promotion. 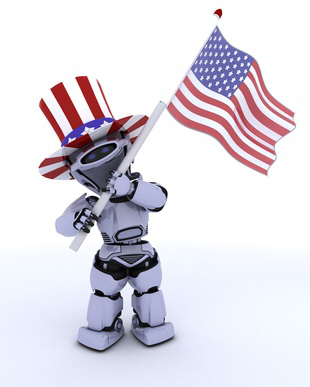 In recognition of the Labor Day holiday, Q Source's offices will be closed on Monday, September 5th, 2016. We will re-open on Tuesday, September 6th. The Q Source family wishes you a safe and enjoyable holiday. We thank you for your continued patronage and look forward to serving you throughout the year. PLEASE NOTE: QSource.com is available 24-hours-a-day for purchases and product information. Any orders placed through QSource.com on Monday, September 5th, will be processed on Tuesday, September 6th. P.S. – If you have free time over the holiday, why not visit our YouTube Channel or our Q Source Resource Blog for a selection of informative and entertaining videos and articles. 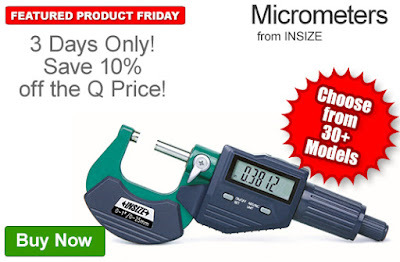 Get 10% off the Q Source price of INSIZE Micrometers. Our FPF090216 Coupon Code is auto applied when you add an eligible micrometer to your shopping cart. This Featured Product Friday (FPF) promo is valid from today, September 2, 2016 through Sunday, September 4, 2016 and the code is unlimited use. Choose from a variety of highly accurate INSIZE Micrometers. With more than 30 eligible micrometers, you’re sure to find the measuring tool to fit your application needs. For further questions about Featured Product Friday, please read our informational blog post, call us (800-966-6020), or send us an email. Please note: This promo is valid only at QSource.com and expires on September 4, 2016. Our series of ACL Staticide Buy 5, Get 1 FREE promos continues. Today marks the second of three different special offers and, this time around, the eligible ACL aerosols include the 8623 Staticide Flux Remover and the ACL 8624 A4 All-Purpose Flux Remover & Cleaner. All you have to do to take advantage of this exclusive sale is to visit the QSource.com promo page and add five eligible aerosols to your cart. A sixth FREE can will be added automatically. This special offer is valid through October 31, 2016. A powerful solvent for the removal of substantial baked-on flux deposits resulting from no-clean soldering applications. ACL’s 8623 is a flammable, non-corrosive, and RoHS-compliant super-strength cleaner that penetrates rapidly into hard-to-reach areas and evaporates quickly without leaving residues. An extra-strength environmentally friendly replacement of HCFC-141B and AK225. ACL’s 8624 is a strong, powerful solvent that is safe on electronics and dissolves oil, grease, ionic and non-ionic residues. It also removes R, RA, RMA, no clean fluxes, and baked-on high temperature flux residues. Shop this limited-time buy 5, get 1 FREE special offer through October 31, 2016 at QSource.com. It’s a great time to stock up on quality flux removers like the ACL 8623 and 8624. You may also contact us via our Web site, phone (800-966-6020), or by email.